In its glory days, the saddle-shaped arena near downtown Phoenix attracted cheering fans of Elvis Presley, Bob Dylan, Nirvana, the Phoenix Suns – even women’s roller derby. 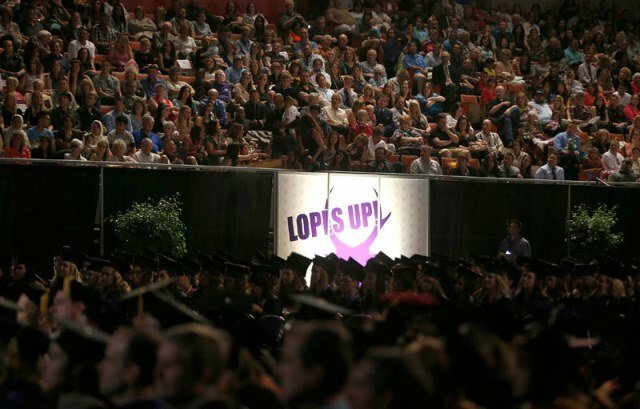 But on Thursday, the applause and shouts at Veterans Memorial Coliseum were all for Grand Canyon University’s Class of 2014. 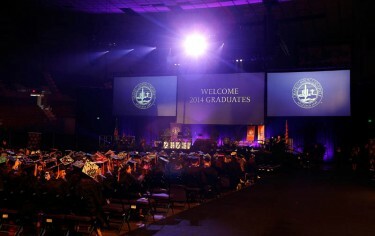 Nearly 1,300 traditional students representing GCU’s colleges – Nursing and Health Care Professions, Business, Arts and Sciences, Fine Arts and Production, Education and Theology – crossed the purple-hazed dais in the gussied-up Coliseum during morning and afternoon commencement ceremonies to the great joy of thousands of placard-waving, horn-blasting, bouquet-holding family members and friends. Veterans Memorial Coliseum, which has hosted everything from Elvis to the NBA Finals, became the makeshift home for commencement because of renovations being made to GCU Arena. “We are so proud of what you have accomplished, what you have done academically, from a performance standpoint, but especially in servanthood and what you have done in and around campus,” University President/CEO Brian Mueller said. Coincidentally or not, the pairing of the venue and the commencement speaker, Air Force Maj. Dan Rooney (ret. ), was genius. Rooney started Folds of Honor to support the spouses and children of fallen American soldiers. The Coliseum, shortly before its opening nearly 50 years ago, was renamed from the Arizona State Fairgrounds Exposition Center to a moniker that would honor Arizona’s war veterans. LaDawn Escobar (third from left) with her nursing pals backstage Thursday before commencement at the Coliseum. Escobar has had her share of challenges over the past four years. “I got divorced, I got remarried, I became a grandmother and I got cancer, all in nursing school,” said Escobar, who was diagnosed with breast cancer in January and is just ending her first phase of chemotherapy. There was no shortage of pink shoes in support of graduate LaDawn Escobar, who is being treated for breast cancer. The Gilbert resident has some rough months ahead. So, rather than job hunting, she is planning to volunteer where she receives treatment at the MD Anderson Cancer Center. As Escobar was sharing her story, several classmates approached her, one sporting a pink “L” button, another handing her pink ribbon stickers and several wearing shoes (in pink, of course). “The Lord has really made it possible for me to get here, but it has taken a village,” she said. The student speakers for the Class of 2014 were Deborah Baldwin (B.S. in nursing) and Haley Sheahan (B.S. in secondary education, with an emphasis in math). During the morning ceremony, Baldwin was introduced by Dr. Anne McNamara, dean of the College of Nursing and Health Care Professions, in a way that would make any parent proud. “She’s going to make an amazing nurse – you want to see this face on the other side of the bed – and not only is she smart, she loves Jesus,” McNamara said. Before introducing Sheahan, the student speaker for the afternoon ceremony, Dr. Kimberly LaPrade, dean of the College of Education, urged the graduates to inspire excellence with purpose and passion. “Believe deeply in your ability to be a force for good in the world,” LaPrade said. Sheahan encouraged her classmates to embrace their individuality, hold onto their values, speak their minds and work hard. “Dream big, take lots of risks and change the world,” she said. “I get ‘Colombo’ or ‘Colombus’ a lot,” he joked. But the announcers got it right. 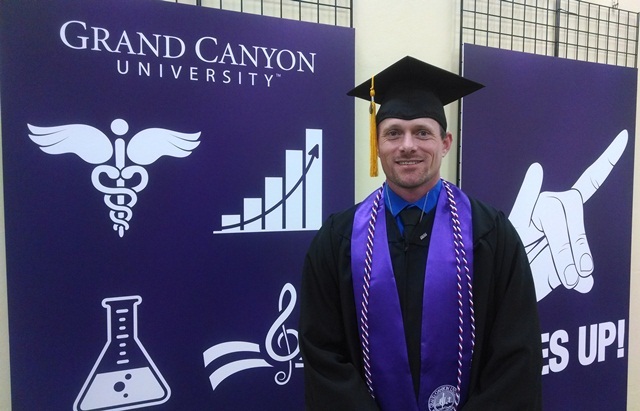 After serving as the founding president of GCU’s Student Veterans Association this year, Colombel graduated with a justice studies degree Thursday — marking his first academic step toward teaching someday. Colombel, a former Marine Corps staff sergeant who served in Iraq, helped grow the SVA into one of the most popular clubs on campus. With hundreds of student veteran members now, the SVA has met with Arizona policymakers on vets issues and volunteered with local organizations dedicated to helping homeless veterans. That tradition, Colombel said, ought to continue after he leaves Phoenix on Tuesday to return to his native Louisiana to establish a veterans center at Northwest State University outside Shreveport. “I just hope (GCU’s SVA) continues to grow and people go there to find that family, that brotherhood,” he said, adding that the club helps link student vets to a variety of resources to assist with the transition from military to civilian life. Colombel said he plans to earn a master’s degree in teaching with an emphasis on homeland security so that he can continue to mentor and inspire students on justice issues. When the events crew started working on venerable Veterans Memorial Coliseum early Wednesday morning, they were faced with the sizable task of filling a lot of empty space. More than 12 hours later, the stage covered the gaping holes at one end, the appropriate purple carpeting ran up the middle of the lower-bowl seating area and the graphic panels on each side added a nice touch. Mission accomplished. “It’s exciting to see it now,” Girl said. The 48-year-old facility, which cost $7 million to build and includes the outdoor-stadium fairgrounds, was home to the Phoenix Suns until 1992 and over the years has featured everyone from Pope John Paul II and Mother Teresa to Elvis Presley and the Rolling Stones. These days, it is home to the Arizona State Fair, occasional concerts and various other events, including high school graduations. But this was its first college commencement in a long while, according to Shannon Miller, the Coliseum’s event specialist. Part of that vision was the idea from Helen Bleach, senior director of university relations and campus events, to have a remote-control blimp dropping cards with congratulatory notes and Bible verses on the graduates before each ceremony. Bleach had seen it at a Suns games at US Airways Center and thought it would be a light-hearted touch, but it wasn’t OK’d by the fire marshal until early Wednesday afternoon. It’s a good thing they had a few years to refine it. In the early years, according to Ray, they tried dropping T-shirts and even stuffed animals from it. “That didn’t work out too well,” he said. Grand Canyon University can’t seem to get rid of Kyle Speed. But why would it want to? Speed, who looked dapper in a purple bow tie as he welcomed and directed grads during commencement, was a GCU fan favorite as a University advocate, family man, friend, believer and basketball star during his two-year tenure. The sports management grad left the University in 2012 to pursue a career in coaching. 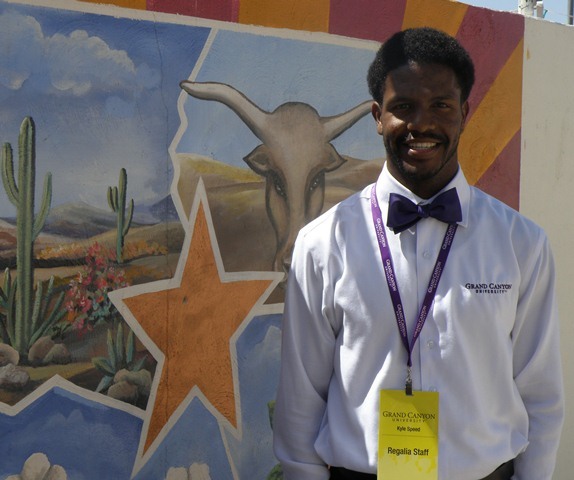 After a brief stint as a youth club coach in Kansas, he accepted a position as a GCU admissions representative in September. Speed, 27, whose style of play lived up to his last name, joined the then-Division II Antelopes in 2010 and led the Lopes in points and assists en route to a postseason appearance in his second season. A banner featuring the former point guard still hangs in the Antelope Reception Center in GCU Arena. Speed became a personable, Christian friend to students and staff. He often would be seen walking his children, KJ, now 5, and Eva, 3, around campus. Speed said he and his wife, Bree, who works for GCU technical support, always have considered GCU home. Like winners of the Super Bowl, newly minted graduates Kaitlyn Yates and Natalie Shuler are going to Disneyland. 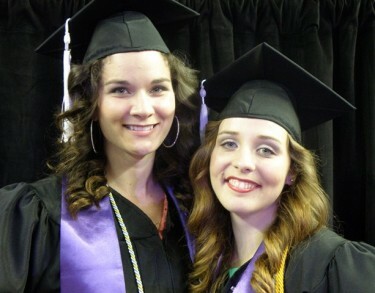 The two music majors, part of the first full class of graduates from the College of Fine Arts and Production, were given the four-day trip by parents at Sunset Ridge Elementary School in Glendale. That’s where they co-directed “The Little Mermaid Jr.” in March, amid their preparations for the usual year-end load of recitals and concerts. Lately, however, they have been going full time at saying their goodbyes. “I’ve been justifying putting off things by saying that I won’t be seeing these people again,” Shuler said of her classmates. Yates hopes to follow Shuler to the master’s degree program in vocal music at the University of California Northridge. She returned from a partial thyroidectomy two years ago to land a prominent role in the opera “Cosi fan tutte,” in which Shuler also had a major role. GCU’s intrepid Marketing Department had commencement covered from all social media angles, including through a flurry of personalized text messages. The spirit of the entire day unfolded in photos and commentary on the University’s Facebook and Instagram pages. But visitors also had the option of texting messages to graduates via a program that displayed heartfelt or hilarious shout-outs on two Jumbotron-like screens flanking the main Coliseum stage. Becky Barber, who oversees social media for the marketing staff, estimated that she and staffer Sam Brunner would edit as many as 6,000 text messages by the end of the day. Their job was to eliminate any duplicate texts (of which there were many) and any uncouth language (of which there was some). The end results read like a real-time thread of kudos and blessings from moms, dads, siblings and buddies. Barber said the texts allowed people in the Coliseum crowd, and others unable to attend, to interact with graduates. “However we can get people who can’t be (at commencement) engaged is a good thing,” she said. Dave Smith, GCU’s director of academic excellence for the College of Education, and Alisha Darkus, learning and development specialist at the University’s Peoria campus, announced nearly 1,300 names as graduates crossed the stage to receive their diplomas during the two sessions. Smith is a seasoned veteran when it comes to pronouncing names, having served as the commencement announcer for the past three years. His trick? Be confident in the pronunciation, which has worked well for him in the past when he has faced names with a high degree of difficulty (Vidhubala Madhusoodanan is an example, from last year’s ceremony). Regardless of whether he’s pronouncing Joshila Muraleedharapanicker (another grad from last year), Smith said there is no place he’d rather be than commencement.